Pecka Playscape is the fusion of a playground, sculpture park and educational trail. 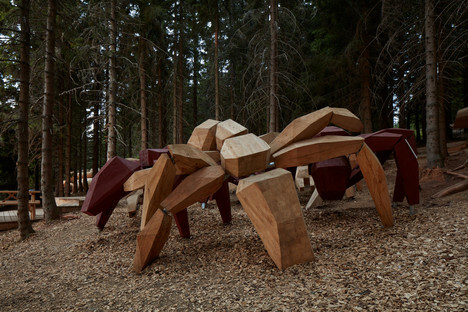 Pecka Playscape is the fusion of a playground, sculpture park and educational trail. This project by sculptor Matěj Hájek and architect Tereza Kučerová from Moloarchitekti is set in the picturesque setting of the Krkonoše National Park in the Czech Republic. As beautiful as a really special natural backdrop like the Krkonoše National Park in the Czech Republic may be, in this world of videogames and virtual reality, it takes a lot to convince kids to leave their electronics at home and get out into the countryside for some fresh air. So, a real drawcard is needed to give parents and kids a valid reason to get out and about. These are the considerations behind the creation of Pecka Playscape - Herní Krajina Pecka in Czech - a unique combination of playful elements and installations located in the Velká Úpa di Pec ski resort, 1062 metres above sea level in the national park, and easily accessible by cable car. The client is the city of Pec and their goal was to get adults and children alike into a forested area where they could take in the fresh mountain air and to encourage them to engage with natural materials like wood, water and stone. Not only that but they also wanted this new attraction to take some of the pressure off other areas of the park that are overrun with tourists in the summer season. The sculptor Matěj Hájek and the architect Tereza Kučerová, founding partners of Moloarchitekti, who also created the Bororo park at the Prague Zoo are the creative force behind the project, a cross-border cooperation with the Karpacz mountain resort on the Polish side of the Krkonoše - Giant - Mountains that will eventually build its own landscape game. 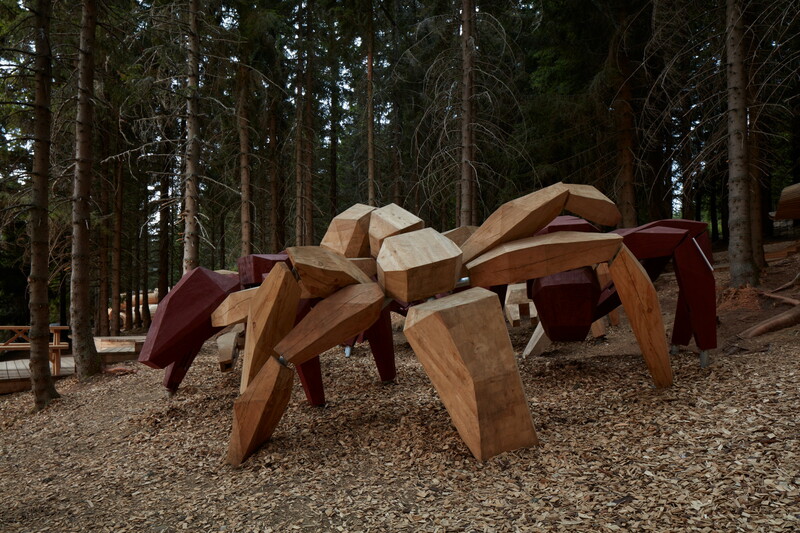 All the elements of this playscape were designed to ensure they were harmonious with the original landscape, drawing inspiration from the wildlife found in the Krkonoše Mountains. This playscape is thematically divided in the world amongst the trees, with a 5-metre-high trail along bridges hanging between giant replica black-stork nests - the tree walk. Then, the world on the ground adopts installations that reference the various animals in the zone and turn into elements to explore through physical activities with differing levels of difficulty. Each element has its own information panel with illustrations and educational content about the animals portrayed, including salamander, lynx, deer, the viper, the bear, just to name a few, in a clever combination of natural sciences and physical education, roping in the parents as well. Pecka Playscape is actually temporary in order to limit the environmental impact. For this reason, the foundations of most of the installations use steel ground screws that anchor the prevailing material of larch wood, both in consideration of the climate and the site's logistics. A smart initiative so the cable car system can also be used during summer, an invitation to spend quality time outdoors and at the same time to bring people back to nature.